This Ontario, California hotel is a 100% non-smoking property offering convenient access to the Ontario Convention Center and other local attractions. Welcome to the Best Western Plus Ontario Airport & Convention Center where customer satisfaction and convenience are at the top of the list. Located with easy access to California's Interstates 10 and 60, this Ontario hotel is 100% non-smoking property. Hotel guests will be within walking distance of the Ontario Convention Center and near many local attractions including the California Speedway and the Los Angeles Fairplex. 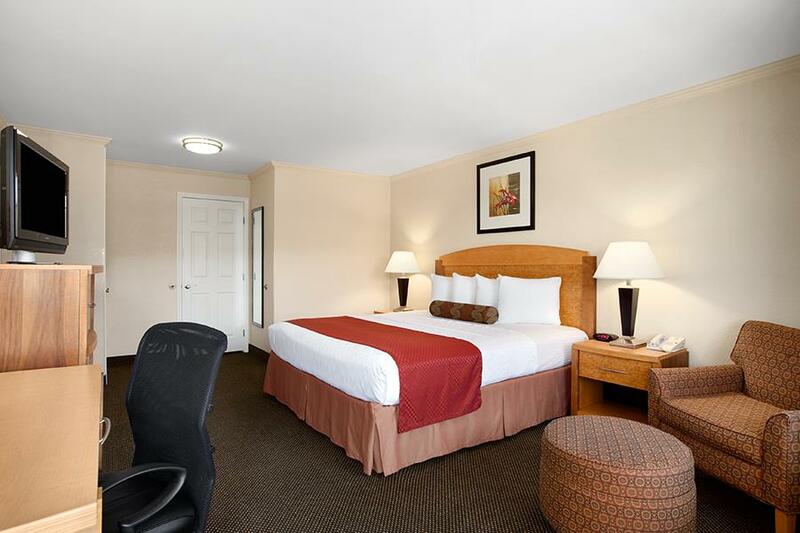 The Best Western Plus Ontario Airport & Convention Center features 154 well-appointed guest rooms, each equipped with a refrigerator, microwave, cable satellite television with HBO and high-speed Internet access. Enjoy a complimentary full breakfast each morning. One of the many convenient area restaurants. Other hotel amenities include an outdoor swimming pool, hot tub, guest laundry, a new business center with full business services and meeting facilities accommodating up to 70 people. The hotel also features a complimentary 24 hour airport shuttle. There are a variety of shopping options available within 10 miles of the hotel including the Ontario Mills Mall and Victoria's Gardens Shops. Families visiting the area will enjoy spending the day at Raging Waters Theme Park, Knott's Berry Farm or Disneyland Amusement Park. Both the University of California Riverside and Cal State San Bernardino are within a few minutes of the hotel, making the Best Western Plus Ontario Airport & Convention Center ideal lodging for guests visiting students. Make a reservation today and save at the Best Western Plus Ontario Airport & Convention Center! Enjoy your stay. From: I-10/San Bernardino Freeway. Take Vineyard Exit, then drive two blocks south on Vineyard, the Best Western Plus Ontario Airport & Convention Center is on the right hand side. From: CA60/Pomona Freeway. Take the Grove exit, then drive 2.9 miles north on Grove. Turn right on Holt. About one mile turn left on Vineyard. The Best Western Plus Ontario Airport & Convention Center is on the left hand side. Ontario Convention Center,0.25 mile(s) from Ontario Convention Center, Located just steps away!